DID YOU KNOW? Every Monday (or so), I send out a short email newsletter with the three most important things you need to know in digital marketing. This isn’t your usual rehashing of old news — it’s my own take on developments, results of testing my agency does, and more. It’s the shortest — and most helpful — enewsletter you’ve ever joined! Here’s a sample from October 20, 2014. Facebook has been sending out emails to people who run brand pages telling them to sign their page up to their new Business Manager. At my agency, engageQ digital, we tested two pages and it ends up seriously messing with your ability to administer your page. Most notably, you won’t be able to comment on as your Page (!) unless you switch over to their new Business Manager site. It’s a complicated mess of new settings, new design, and doesn’t seem to add anything to the user experience. For now, stick with what you’re doing. If you’ve got a business and you’ve posted YouTube videos on your Facebook page, it might be time to reconsider that tactic. New numbers we’re seeing are showing engagement (number of people who interact with the video) dropping considerably for YouTube-linked videos. 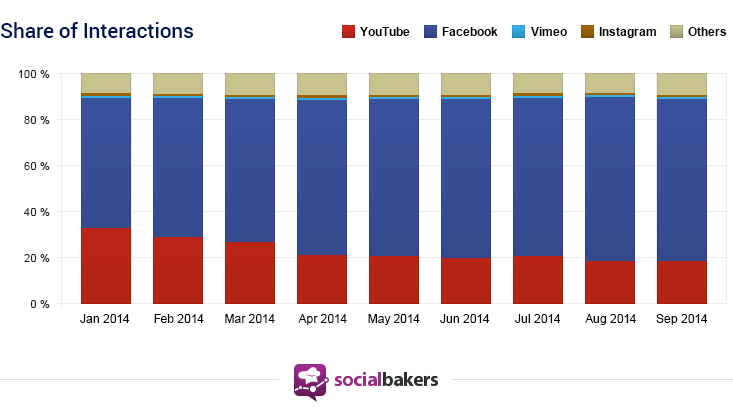 You’ll get more visibility and engagement if you also upload the video directly to Facebook. Trying to Reach Teenagers? Get Off Facebook. It’s long been thought that teens are bailing out on Facebook. That’s only been true to some extent. There’s been some attrition, but nothing like the exodus we’ve seen in the last six months. 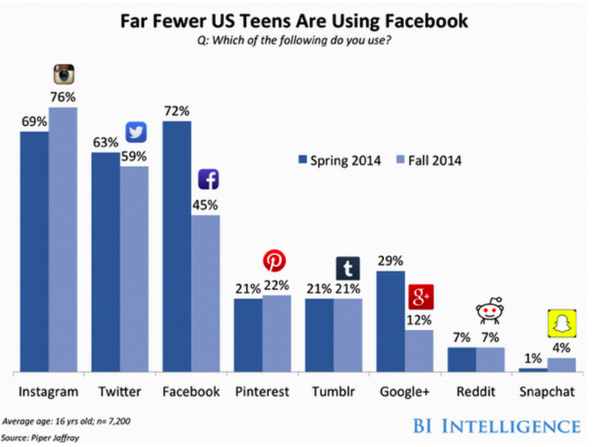 Take a look at that third column — that’s the massive drop in teens using Facebook in just the last six months. Problem is, the channels which are benefitting (Instagram, SnapChat, and WhatsApp) have not set up much in the way of advertising tools. For Instagram, at least, start posting pics regularly, and be sure to include lots of hashtags, as much of content discovery is through surfing hashtags. Sadly, there’s no way to use posting tools like Hootsuite or Buffer to post to Instagram. They want you do to it through a mobile device. We’ve had some success using Gramblr — which you may want to try. Hope this is helpful — see you next week!